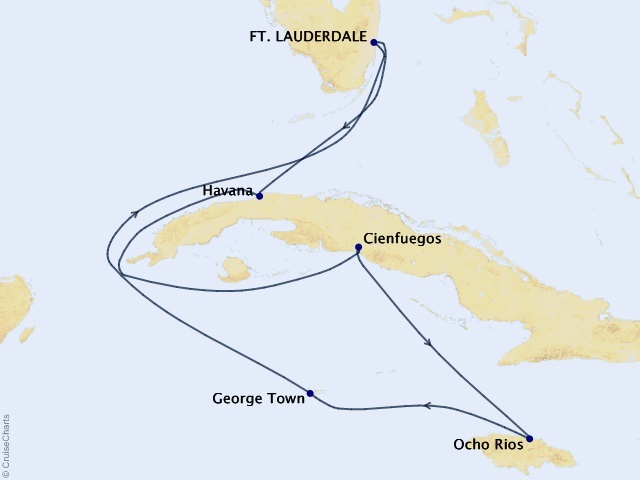 Departing from Ft. Lauderdale on November 27, 2019, prices starting at $949. Grandly proportioned and recently enhanced, ms Veendam offers an onboard experience defined by spacious comfort and the latest amenities. 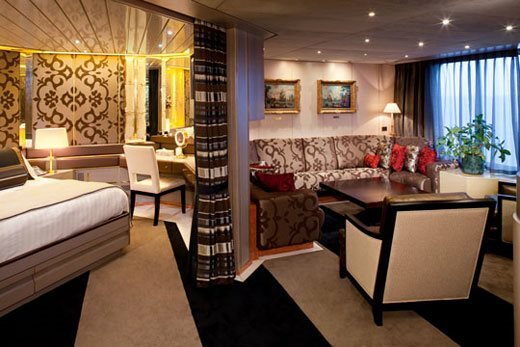 Guests aboard Veendam enjoy a multi-million dollar art and antique collection, wide teak decks, elegant dining rooms and spacious staterooms—many with private verandahs. Onboard activities abound aboard the ms Veendam, including exclusive BBC Earth Experiences: learn about the ocean and natural world through amazing concerts, films, shows, and children’s activities. Hone video-editing, movie-making, and scrapbook skills in the Digital Workshop powered by Windows®, rejuvenate at our Greenhouse Spa, go to a wine tasting or simply relax and unwind. On crisp white linen, course after course arrives. Behind the scenes, master chefs have brought flavors to perfection. 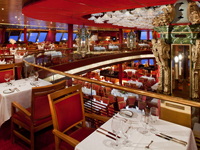 For an elegant breakfast, leisurely lunch, or unforgettable five-course dinner, the Rotterdam is your destination for elegant dining aboard. 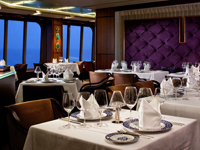 Refined and luxurious, the Pinnacle Grill represents the pinnacle of exceptional dining. Creative, innovative menus featuring choice sustainability raised beef and premium seafood delight the palate. Explorer's Lounge offers a refined place to sit back and sip delicious coffees, drinks and liqueurs, while enjoying the sounds of the Adagio ensemble. 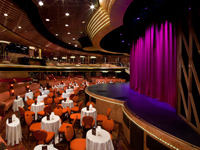 After dinner, take your seat in the ship's magnificent theater for a dazzling show featuring talented performers, including musicians, illusionists, comedians, and Broadway veterans. 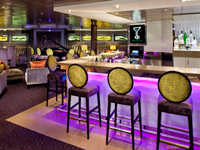 This lively mix of three specialty bars - Champagne, Martinis, and Spirits & Ales - is a perfect place to meet friends. 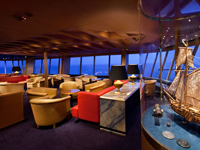 This lounge's sweeping, panoramic views allow you to enjoy the sunset, then turns into a fun dance club after dark with a DJ spinning tunes. Join the resident Culinary Arts Center Host for hands-on cooking classes and cooking demonstrations with talented chefs and special guest experts. 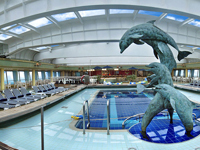 Take a refreshing dip in one of the outdoor pools, or simply relax in one of the many lounge chairs and soak up the sun. Relax in this comfortable café, powered by The New York Times, featuring the daily crossword puzzle, custom espresso drinks and pastries, and the most comprehensive selection of books and travel guides at sea. Children, ages 3-7*, can participate in such activities as pirate treasure hunts, hands-on pizza making, storytelling, "Little Artists" crafts, ice cream sundae parties, and a farewell pajama party. *Please note: All children participating in Club HAL must be completely toilet trained. No diapers or pull–ups are permitted in the Youth Center. Youth Staff cannot assist children in the restroom. Tweens, ages 8-12, can take part in Xbox and Wii tournaments, relay races, scavenger hunts, and karaoke disco parties. Teens, ages 13-17, can enjoy mocktail mixology classes, late night sporting competitions, teen yoga and hip hop classes, guys verses girls scavenger hunts, cooking demos, tech classes, and teen-only night club events. When there are more than 100 children on board, a HAL Talent Show is offered. HAL Kids Culinary Workshops now offer children a unique and fun learning experience. Kids will learn basic cooking techniques, kitchen safety, new ingredients, and how to follow recipe instructions. Aside from the fun involved, cooking encourages kids to think about numbers and measuring, cleanliness, safety, and time management. 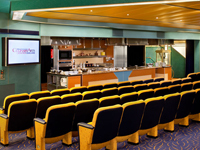 The Culinary Art Center is a place where questions are encouraged and having fun is a must. HAL Kids Culinary Workshops are geared towards two age groups: ages 3-7 and ages 8-and-up. Teenagers aged 15-and-up may participate in the adult classes. The menus range from simple to teen gourmet, and each student receives copies of the recipes prepared in class. All classes are complimentary and last approximately one hour. HAL Youth Programs recognize that some children may have special needs. * Special needs children are invited to attend activities based on their chronological age. HAL Youth Programs have many staff members trained to work with special needs children. Guests should make HAL aware of this when booking their reservation to ensure that appropriate staff will be available. *Adults that are not Youth Staff are not permitted to remain in the Youth Center unless attending to a child with special needs. 2 lower beds convertible to 1 queen-size bed and shower. Approximately 141–226 sq. 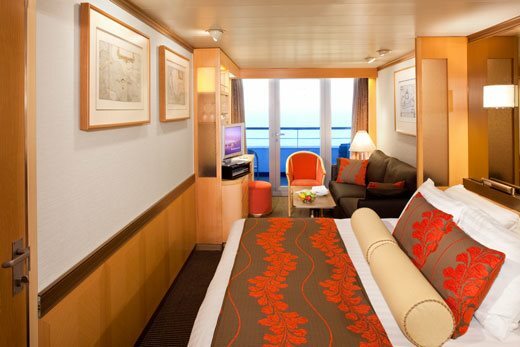 ft.
Opt for the serenity of a new Spa Suite or Stateroom, featuring modern spa amenities such as yoga mats and an iPod® docking station. Also available are exclusive spa treatments from the nearby Greenhouse Spa and Salon. 2 lower beds convertible to 1 queen-size bed and shower. Approximately 141–226 sq. ft.
2 lower beds convertible to 1 queen-size bed, bathtub, shower. Approximately 174–255 sq. ft.
2 lower beds convertible to 1 queen-size bed, bathtub, shower. 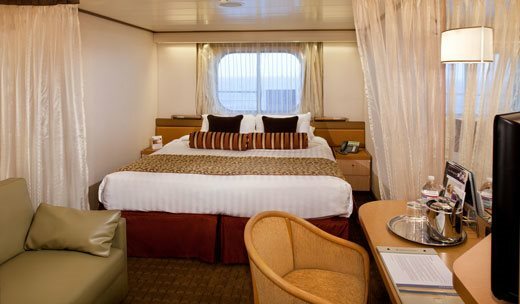 All DD staterooms have partial sea views. Approximately 174–255 sq. ft.
2 lower beds convertible to 1 queen-size bed, roll-in shower, wide interior & exterior doors. The schematic shown here displays the layout of stateroom G706. 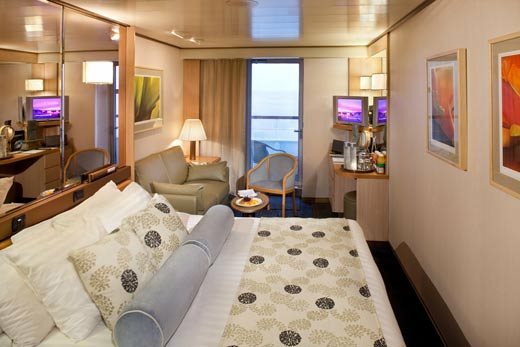 Stateroom G711 is a mirror image of this schematic. 2 lower beds convertible to 1 queen-size bed, bathtub & shower. Sliding glass doors lead onto the walk-around Lower Promenade Deck. Approximately 181–256 sq. 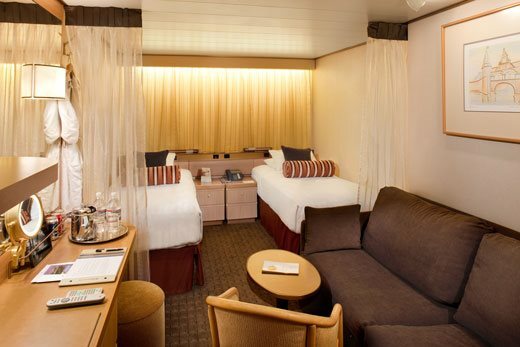 ft.
Opt for the serenity of a new Spa Suite or Stateroom, featuring modern spa amenities such as yoga mats and an iPod® docking station. Also available are exclusive spa treatments from the nearby Greenhouse Spa and Salon. 2 lower beds convertible to 1 queen-size bed, bath & shower, sitting area, private verandah, mini-bar, refrigerator, floor-to-ceiling windows. Approximately 244 sq. ft. including verandah. 2 lower beds convertible to 1 queen-size bed, whirlpool bath & shower, sitting area, private verandah, mini-bar, refrigerator, floor-to-ceiling windows. Approximately 283 sq. ft. including verandah. 2 lower beds convertible to 1 king-size bed, whirlpool bath & shower, large sitting area, dressing room, private verandah, 1 sofa bed for 2 persons, mini-bar, refrigerator, floor-to-ceiling windows. Approximately 575 sq. ft. including verandah. 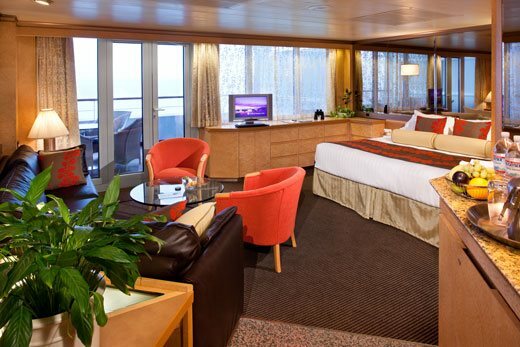 A very special amenity exclusively for guests cruising in a Neptune or Pinnacle Suite, the industry-leading Neptune Lounge features a private place to relax, socialize with other suite guests and enjoy the personalized service of a concierge. 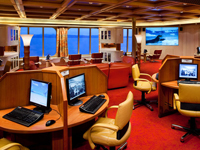 The fleet-wide lounges provide worktables, large screen television, library, sofas and chairs, refreshments throughout the day and Wi-Fi for a small charge. 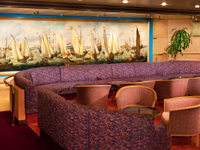 One-Touch 24-hour Concierge Service is available when the Neptune Lounge is closed. Bedroom with 1 king-size bed, oversize whirlpool bath & shower, living room, dining room, dressing room, private verandah, pantry, 1 sofa bed for 2 persons, mini-bar, refrigerator, guest toilet, floor-to-ceiling windows. Approximately 1,273 sq. ft. including verandah.